Discover with our mountain guides, the most beautiful landscapes and the most exciting mountain activities near Madrid and all over Spain. All year long and for all age groups. Dare to Adventure! 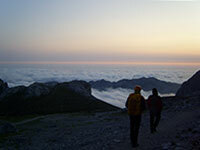 Spend a day climbing near Madrid in family or ascent a mithycal route of any Spanish massif with our expert guides. From acequibles levels for all ages , without prior experience to advanced and more technical climbs. Let us be your partner to climb that dreamed peak. 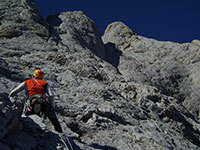 That summit you always see in pictures, now it is at your fingertips with the help of our experienced mountain guides. 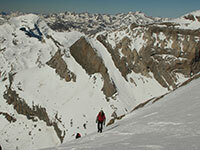 We´ll do it Climbing, walking or using our ice axes and crampons. Ask about! Have you ever wondered how is to walk through a forest floating on the snow? 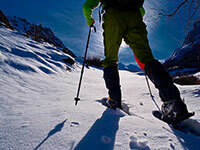 Come with us and discover the incredible world of snowshoeing in Madrid, Pyreenes and Sierra Nevada. The pleasure of walking by itself. Relaxing hikes and treks in La Pedriza near Madrid and the Fuenfría's woods for the whole family or long trekking routes as the mythical Cuerda Larga of Guadarrama Mountains. The best to fight the summer heat in a refreshing and funny way. 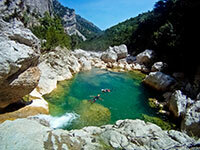 Come with Patagonica to jump, abseil and slide through the best canyons in Spain.